Today! Jesus had not yet died and risen. The gates of heaven had not yet been opened by his Redemptive sacrifice. The souls of the just from the Old Testament times were still waiting in Limbo for release. 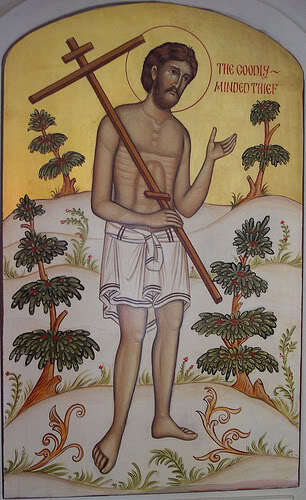 How, then, could Jesus promise this thief that he would be in Paradise today? This is a good example of the very different concept of what we call time. For us on earth it is a linear thing, one moment following another. But for God and those in eternity, it is one single moment - the eternal NOW. But what about the past life of this sinner? Even if he had "absolution" from Jesus, Himself, did he not have an enormous debt of punishment due for his sinful deeds? Is that not what Purgatory is for? Yes, Purgatory is a period of healing and cleansing from the remnants and wounds of our past sins which have been forgiven. But it need not wait until we are dead. 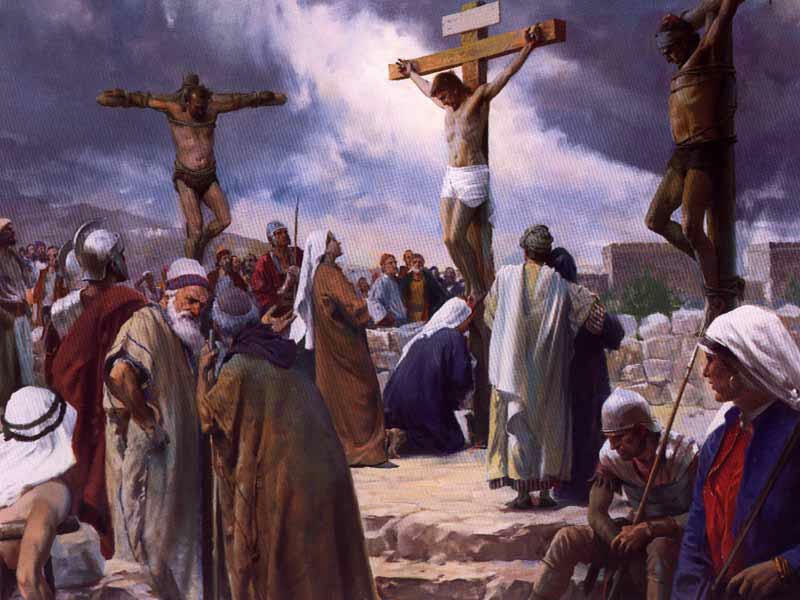 This good thief (tradition calls him Dismas), acknowledged that he was suffering on the cross as a punishment for his crimes. He united them to those of Jesus when he said, "we are under the same sentence of condemnation; we justly, receiving the due reward of our deed, but this man had done nothing wrong". And so the sufferings Dismas endured and united to those of Jesus, were his Purgatory. In a similar manner, I believe that we can embrace with a penitential heart, our daily sufferings – pain and illness, rejection by a loved one, financial crisis, anxiety, frustration, grief – and by uniting them to the sufferings of Jesus they can suffice for our Purgatory. Thus on the day of our death Jesus can say to each one of us, "Today you will be with me in Paradise". Jesus says ‘them’ – not him, not Judas who betrayed Him, not Peter who denied Him, not Jacob who drove the nails into his hands, but ‘them’ - all of them including us, including me. At the very moment that each of us is turning against Him, He is forgiving us. Whether I am attacking Him directly, as in the Eucharist, or indirectly through my neighbor, He has prayed for my forgiveness even before I have sinned. What an experience! To be loved so much that I am forgiven before I have asked for forgiveness. This awakens much gratitude in me. If I am loved that much, I want to return that love, and therefore I will make every effort not to offend my Lover again. Can I offer the same forgiveness to those who offend me? It is very hard to do, but the examples of many saints show that it is not impossible, but can be done with God’s grace. If we but ask our generous God, He will give us this precious grace. Lent is a special time of special graces. I want to use it well and will begin by asking for the grace of forgiving others as Christ has forgiven me. Some new and interesting books have come our way recently and we would like to share with you just a few highlights. A favorite story for generations of young and young-of-heart readers, is "The Wizard of Oz". As we watched the movie over and over we learned to identify with each of the characters. Fr. Nathan Castle, OP has written a book which helps us learn from the spiritual and psychological situations encountered by one after another of the friends in the movie. 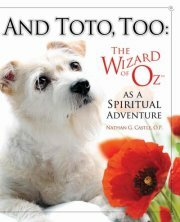 Be sure to look for "And Toto Too" and enjoy some hours of reliving this delightful story. "Just A Minute" is a small new book with a one minute reflection on the Scripture Readings of the day. Fr. Vincent Serpa, OP, who ia currently working at Catholic Answer, gives us in this little volume the fruit of his own contemplation. Each day has a page which is so short that even a busy person can take just one minute to bring the Scripture of the day into his or her own life. What a beautiful way to focus on God’s word during Lent and afterward. Our gratitude to our Dominican Laity Corpus Christi Chapter who gave each signed copy for us to read. From our Dominican Monastery of the Mother of God in West Springfield, comes a delightful account of watching humming birds approach the feeder in the monastery garden. 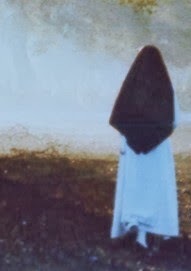 Sister Mary of the Sacred Heart Sawicki, OP and her Sisters watched for many a long hour and gained the confidence of the tiny birds and they came to drink the sweet nectar provided for them. Contemplating these little creatures, Sister compares the birds to God, the great Hummer, who gradually draws near to each of us in prayer. Her book "The Hummer and the Hummed" will give you guidance and encouragement in your path to the Heart of God. His blessed 'hand' comes crashing down upon us. We wonder Lord, how can this be? you could never fathom it. to allow you to know what is that 'blow'. Recently our Dominican Brothers have been sharing with us the wisdom they are gradually acquiring in their years of study. This is continuing the tradition which began with St. Dominic, himself, that the brothers feed their sisters with spiritual nourishment through lectures and discussions. In turn the nuns return the favor by contributing the fruit of their contemplation. In this way both are enriched and encourage each other in their vocations. 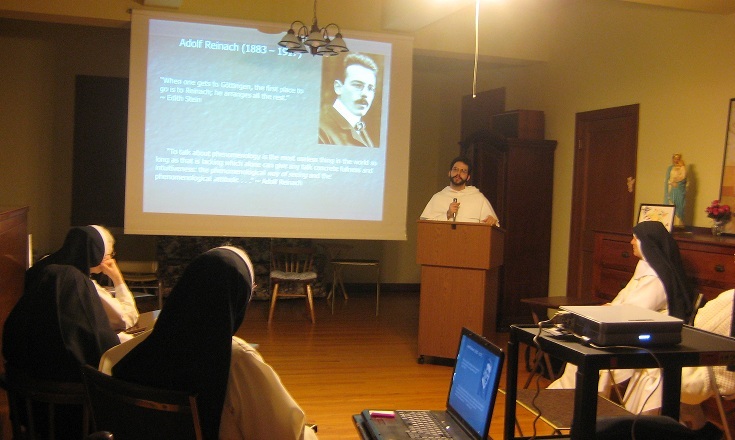 Brother Dominic David, OP came to our monastery with the background of much study on the life of Edith Stein (Saint Teresa Benedicta of the Cross). 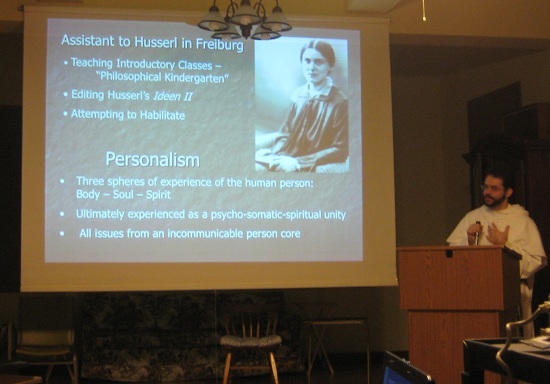 In two lectures he gave an account of her background, her philosophy, her teaching and writing, her entrance into Carmel and her martyrdom at the hands of the Nazis. She died in the gas chambers at Auschwitz on August 9, 1942. On another occasion Brother Peter Hannah, OP treated us to a lecture on the importance of the observance of the Sabbath rest in the lives of all Christians. As Catholics we observe Sunday, rather than Saturday, because that is the day of the Resurrection of Christ. It is not just a matter of refraining from manual labor, but it is making the day holy by resting in the Lord in contemplation, and caring for our neighbors in charity. We look forward to more of our Dominican Brothers coming to share the insights which they have received in the classroom, in private study and in prayer. In return we pray for them to become holy Dominicans, working for the salvation of souls in parishes, schools, hospitals, and anywhere they can find those who hunger for truth. 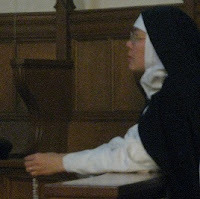 This is the time of year when there are celebrations of the World Day For Consecrated Life. The Holy Father reminded us of this at Solemn Vespers on February 2nd, some dioceses observe this day on Sunday, February 5th. As we consider the meaning of the celebrations we realize that God has given the Church and the world a great gift in the life of the Religious men and women. Each of them, in turn, has gratefully accepted this gift and has made a commitment to live faithfully until death. 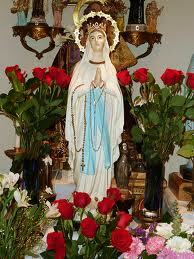 The prayer life of each one must be daily nurtured, and growth in holiness continues throughout life. The fruit of these daily prayers and struggles brings many graces to the world which depends spiritually on the prayer life of Religious.